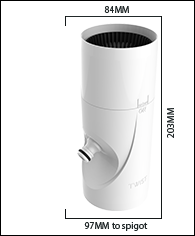 The Marley Twist is a compact rainwater diverter that turns your downpipe into a free source of water for watering the garden, topping up the pool, general cleaning or emergency use. Twist can be easily installed on existing or new PVC downpipes and can quick connect to a collection tank via any standard garden hose fitting. A simple “twist” on-off control lets you access rainwater from your downpipe as and when you need it. Twist is designed to connect a single downpipe to a small collection tank of up to 1,000 litres. Twist has the same UV resistance and 15-year guarantee as our Marley spouting and downpipe systems. To access and remove the debris filter for cleaning, simply slide up the top housing, remove the filter and rinse. The Twist is available in a range of colours to match the Marley Stratus Design Series® range of spouting and downpipes. Twist is compatible with Marley’s RP80® 80mm round downpipe systems. No glue is required and Twist can be mounted anywhere on the downpipe in five simple steps. Click here for instructions. Adaptors are available to connect to other Marley downpipe sizes. Water Capture: Can fill a 300 litre tank in an hour*. Marley RP80®80mm round downpipe – All colours. The Twist is quick and simple to install and comes with a self-adhesive cutting and instruction template. If unsure please speak to a trade professional. Note: If Twist is left in the ‘on’ position and connected to a tank via a hose, the tank may fill to the top. a) If the tank is enclosed, once full, the excess water will back up the inlet hose and drain down the downpipe. No more water can be drawn into the tank. b) Water follows the path of least resistance so if the tank has a top lid, excess water may force the lid up or open rather than flow back out the inlet hose. If this could be an issue we suggest installing an overflow outlet on the side of the tank near the top. Make sure this outlet overflows to an appropriate discharge point. Consult local council requirements. If Twist is being connected to a small tank make sure it is installed above the tank inlet point. Regularly check the debris filter to ensure that there are no debris blocking the water flow. Routinely wash the debris filter. Simply slide the top unit up the pipe to allow removal of the filter from the bottom unit then rinse. Replacement filters are available if required.